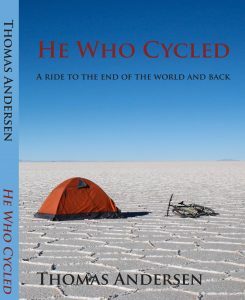 It took a while, but my book “He Who Cycled – A Ride to the End of the World and Back” is now available! Hi Thomas! I’m ordering my copy right now, can’t wait to read it when it gets to me. You should do another Reddit AMA to promote the book! Those were always really popular and its how I first found out about you! Sorry for being late with the reply from your comment. I would love to send you a signed book and a QSL card, but right now I’m in Colombia and will not be back in Europe (where my book is being shipped from) before the end of April. If you can wait 1½ month I will send it then. Otherwise I can also have the unsigned book sent from Germany right away. Which option do you prefer?